Antlers describes themselves as atmospheric black metal, and of course, they are named Antlers. So when I turned on this debut album from the German band, I was expecting something along the lines of an Addaura or Wolves in the Throne Room, or perhaps similar to their fellow Germans, Dämmerfarben. It’s not an odd assumption to make, but it was completely off the mark. The most surprising thing about A Gaze Into the Abyss that hit me first was the vocals. These are not even close to your standard atmospheric black metal vocals, and in fact, you could probably get away saying they aren’t even black metal vocals. They’re much closer to a death or doom style. The overall effect of this is a much heavier sound, and a much deeper sound. The aggression of the vocals is boosted by the speed of the first song, Carnival of Freedom and Betrayal, which starts at a relentless pace, using unflagging tremolo and crashing drums to full effect. But eventually, the song steps back and slows down, and here is where the atmospheric finally comes in. It is similar to bands like Gallowbraid and Cathis Ord, where the atmosphere comes from an epic sound. However, once again, unlike Gallowbraid, Antlers does not make use of any “folk” instruments or sounds. The rest of the album sways from mid-paced back to fast-paced, always keeping that epic sound in mind. The vocals also tend to match the speed of the song, giving lots of variety to Antlers sound. The band also isn’t too shy to throw in the occasional guitar solo, a rarity in atmospheric black metal. When the songs slow down, the guitars take the time to play something melodic and thoughtful. The band doesn’t stick to one speed or sound, switching it up every song, which makes for a better paced album, rather than being weighted too heavily at one side. 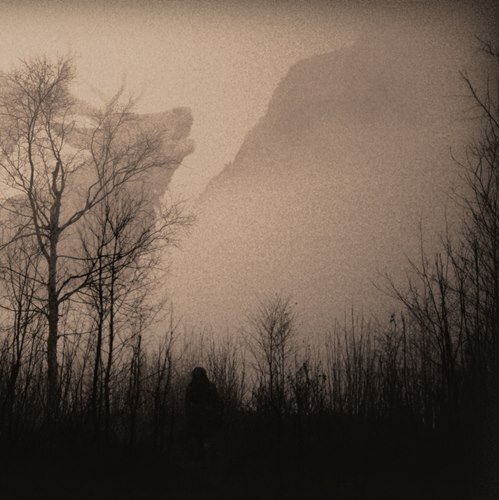 Overall, I would say that Antlers has an interesting and different approach to atmospheric black metal. It’s a strong debut and I’m looking forward to hearing where this band takes their sound in future releases.